1. Put the pecan halves in a frying pan over a low heat and toast slowly for 4 minutes, shaking the pan often, until golden and fragrant. Cool and roughly chop. For the dressing, mix the mayonnaise, lemon zest and juice, mustard, garlic and tarragon with 1 tbsp water; season. 2. Remove 4 of the large outer lettuce leaves and set aside. Shred the remaining lettuce into ribbons. Transfer to a mixing bowl and add the pear, celery and dressing, plus 2 /3 of the pecans and ½ the salad cress. Toss gently to mix. 3. 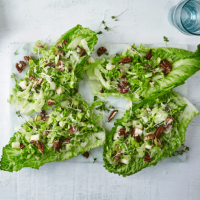 Use each reserved lettuce leaf as a container (you may need to shave a little off the central ribs on the underside of each leaf, so it sits in a boat shape), and fill with the salad. Scatter with the reserved salad cress and nuts before serving.